"Making America's Dream a Reality, One Home at a Time!" Tonia Merlene is an alumni from the University of North Texas in Denton, where she received a Bachlor of Business Administration degree in Marketing Management with a minor in Accounting and International Studies. She has had business marketing experience since 1987 and has been involved in different phases of Real Estate including Commercial, Residential, Property Management since 1990. She has had over 4 years experience in Business Sales, Mergers, Acquisitions, and Divestitures. Some of her previous work expereince is at Grubb and Eliis Real Estate, Henry S. Miller, and Quest Medical. She was directly involved in the Quest/Nueromed Acquisition which is currently known as St. Jude Medical of Plano, TX. Tonia speaks the Russian and Polish languages fluently and is proficient in French and comprehends Spanish, German, Yiddish, and some Hebrew. Tonia is a Dallas native where she has resided her entire life. Tonia has been blessed with 3 talented children: An Actress and 2 Basketball Stars. Tonia's hobbies include country and western dancing, ballet, photography, basketball and family time. She also loves chihuahuas and adopting dogs that need love, nurturing, and a home. Tonia goal is "Making America's Dream a Reality, One Home at a Time!" She loves being a Realtor and loves to help people make their moving experience as stress-free as possible. She takes pride in integrity, ethics, and respect. She knows moving can be stressful and difficult so her goal is to reply to phone calls within 2-hours or less. Tonia specializes in Buyers, Sellers, Relocations, First-time Home Buyers, Short Sales and Foreclosures. 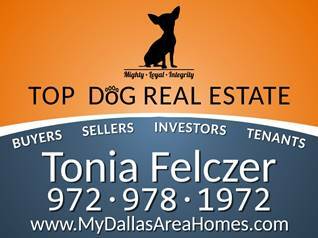 Call Tonia for the best real estate expereince available in the DFW area at 972-978-1972. My Personal Mission: I will listen to your needs and want to establish your goals and objectives. We work as a team to meet your goals and objectives. You will continually be in the loop during the entire process. In this fast paced market, I believe communication is key in meeting your goals and building our relationship. I try to respond to my client's calls and requests within 2 hours by e-mail, text or a personal call. About My Services: I will listen to your needs to establish your goals and objectives. We work as a team to meet both. You will continually be in the loop during the entire process. In this fast paced market, I beleive communication is the key in meeting YOUR goals and building our relationship. Available 24/7, please use my Website to provide you powerful features such as the access to the Multiple Listing Service (MLS) through my MLS Wizard which will help you narrow down the ideal home. Selling your home requires special care and attention in order to get the highest possible price in the least amount of time. Feel free to use my Value Wizard to get an instant comparable sales report. My Links Section is designed to point you to important information on home shopping, owning, and selling. If for some reason do not find what you are looking for, then contact me and I will do my best to get you an answer or point you to a resource. My satisfied clients are my best resource for new business. In this very competitive business of real estate, service makes the difference. My service is Top Notch and has earned me a valuable source of referrals. If you are considering a real estate professional, please give me an opportunity to earn your business too. I am confident you will be very happy!